When his subjects referred to Herod as "the Great," it certainly was not a commentary on his moral character and integrity. Herod was a skilled politician and an eloquent diplomat. At the same time, he was insanely jealous of his position and power. He stopped at nothing to retain his authority; he tolerated no rivals. Immediately after his accession to the throne, he had the entire Sanhedrin (the Jewish ruling council) put to death. He purged the Pharasaic party of anyone who did not approve of his reign. During one purging Herod crucified as many as five thousand Pharisees outside the walls of Jerusalem. One ancient source observed that it was common to pass dozens of crosses alongside the road as one entered Jerusalem. 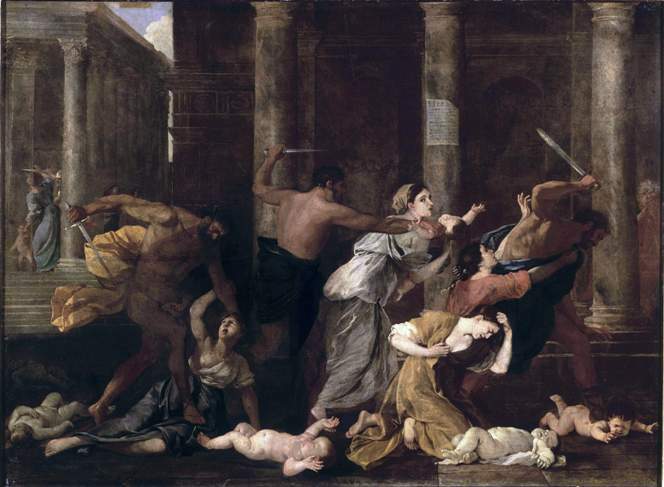 Any sort of suspicion, whether well-founded or not, was sufficient cause for Herod to resort to bloody deeds. Caesar Augustus said it was better to be Herod's pig than his son; for the former would likely live longer. So hated and feared was Herod by his people that he knew they would rejoice at his death. Therefore, just before his death, Herod ordered that when he died, the heads of prominent families should be executed in order that there would be mourning throughout the land. Fortunately, the order was never obeyed. This context makes it is easy to understand why a rumor of a rival king of the Jews was bound to roust Herod's worst fears. There was no room for another king in Herod's world; yet another king does indeed enter. Matthew chapter two presents to us a tale of two kings and the conflict between them. There is Herod, the jealous tyrant, the active participant in the story, and there is also the infant king, helpless and defenseless, passive and dependent. Some have suggested that it is almost humorous to suppose that this baby poses a threat to Herod. Is Herod's worrying shouting in the darkness? But Herod's perception is truly correct. This small ruler is indeed a danger; for this is not any king who comes on the scene only to fade away like all political leaders, whether they are kings or queens, prime ministers or presidents. This king comes as a significant and decisive challenge to corrupt rulers like Herod, who refuse to relinquish their power, even though the kingdom of this child is a kingdom of righteousness and peace that will have no end. This infant king has not come to be taken from his throne; this king is here to stay. He challenges all kingdoms of corruption wherever they might be. This young king also challenges those who rule justly as well; for while we need just leaders, the coming of Christ and his kingdom is ultimately significant and decisive, and the only kingdom that will never end. That can be a difficult admission even for just leaders, for even good rulers tend to become full of their own authority, believing that so much rests on their actions. But the truth of the matter is that no nation controls the destiny of the world; and the message of Matthew chapter two is that in the midst of a violent world, in the midst of crises of human and natural origin, we must remember that with the birth of this infant king, comes the certainty that it is God and not the nations who rules the world. No nation is, in the ultimate sense, sovereign and in charge. To be sure, the nations do attempt to bring the destiny of the world to their own fulfillment, and it is certainly the case that nations can accomplish great things as well as cause terrible tragedies; but the providential care of this world is in the hands of God, not Caesar, and definitely not Herod. No wonder Herod was so agitated. We can fault him for many things, but he was clearly right to consider this little Jewish child a threat. Jesus' existence meant that Herod was on borrowed time. It meant that, even as king himself, he needed to submit to a greater king. Herod refused to do that, so he resorted to what he knew best... to what all leaders of nations know best... eliminating the threat. Herod was unsuccessful in the attempt because this Jesus was not going anywhere. In this brief season of Christmas, what we do is about much more than a sweet baby in a manger, a young mother cuddling her first child, a chorus of angels singing in heavenly harmony, and a star to light the way. This time of the year is about the God who comes into our midst to make things different, to turn the tables, to shake things up, and to put the nations on notice that their end is certain and the redemption of the world will not be found in their power and conquest. God shakes the foundation of the world; for the Lordship of Jesus Christ can accomplish nothing less.